Formally known as Jones Tones! 12/13/18 The whole Allure Adhesive Paint line has been discontinued by the manufacturer. Unfortunately, once they are gone, they're gone. Allure Adhesive Paints formally known as Jones Tones - Puff Paints, Glossy Paints, Metallic Paints, and Glitter Paints. These are fabulous and versatile dimensional craft paints for all fabrics and most other surfaces. sticks to almost anything. Unlike other paints, they are glue based, so they double as a beautiful glue. 2 oz. Puff Paint Squeeze Bottle - Sorry, this item is temporarily sold out. Discontinued. 4 oz. Squeeze Bottle - Sorry, this item is temporarily sold out. Discontinued. 2 oz. Squeeze Bottle - Sorry, this item is temporarily sold out. Discontinued. 2 oz. Squeeze Bottle - Sorry, this item is temporarily sold out. Discontinued. #780 Gold replacement. Put it on, let it dry and it's permanent. That's it! Won't get hard, crack or peel off. PUT IT ON ANY WAY YOU LIKE! Squeeze bottle (comes with), brush, gutta applicator, mist sprayer, etc. Allure Adhesive Paint use non-toxic glue as a base, making them a Fabric Paint, Glue, Dimensional Paint, and a Dye - all in one. Great product! One of the best for wearable art - outlining drawings or transfers on clothing. Use as a dimensional paint. Use as a resist in silk painting. Use as a colored glue to apply sequins, glitter, and beads. Apply a design with the clear and press iCraft Deco Foil over it for a great raised metallic effect. Water them down and use as an instant setting dye. Paint, dip or spray them on. These paints are also somewhat stretchy so they work great on somewhat stretchy fabrics like knits and cotton lycra, even dance tights, etc. No cracking! - Allure Adhesive Glossy Paint: Brilliant colors and a shiny wet look when dry. - Allure Adhesive Metallic Paint: Gives a shimmering & iridescent pearlized finish. 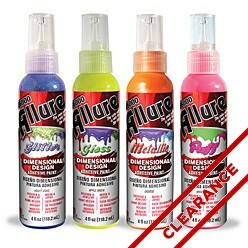 - Allure Adhesive Glitter Paint: Bright Metallic glitter in a clear base. Shake paint down to tip of bottle before painting. Gently squeeze bottle while pushing tip down into the surface you are working on. Or hand paint with a brush. Or use with stencils. Or you can block print with these too. Sprinkle glitter over wet paints for dazzling effects. Dry flat for 8 hours. On Fabric, turn item inside out to wash. Gentle cycle or hand wash. Line dry. To make Paint Peelies: Paint designs on flat plastic, dry for 24 hours. Peel off designs and stick to other hard surfaces like glass windows and mirrors. Very flexible and adhesive. Used on canvas shopping bag (to say "Plastic Bags BLOW") without cracking just deliciously rubbery. Also to re-glue an applique whose iron-on failed. Next stop drawing on clothes! Jones Tones 'glitter glues' 'solid color-without glitter'---in fact ANYTHING Jones Tones pits in a squeeze-bottle is a zillion times better than ANY OTHER BRAND!! I'm the "official sign-maker" of the family and I make "Just Married" "Welcome Home" "Happy Birthday" or whatever someone wants me to make signs as well as using Jones tones "Magic-in-a-squeeze-bottle" Glues and Paints to embellish my calligraphy work on all kinds ofgreeting cards etc.and JONES TONES products have ALWAYS EXCEEDED MY EXPECTATIONS (as well as making my artwork look PROFESSIONAL)!!! I've tried many other "wanna-be brands" in an emergency---like when the craft store is out of "JONES TONES"....and the results can't even begin to compare to "JONES TONES"!I have a "Bridal Shower Sign" and a "Just Married Sign" for putting on the back of the car to make and I 'd ratherswim with the sharks than use another brand (and I don't even know how to swim!!). IF YOU WANT BEAUTIFUL PROFESSIONAL RESULTS.....YOU'LL ONLY USE THEBEST......AND THE BEST IS "JONES TONES" I'd like to rate it "100 STARS" but 5 is the most they'll let me give.Keep up the AWESOME work you do in making the BESTcraft glue products EVER. You make MY projects lookAWESOME!! THANKS A ZILLION from Donna in Pennsylvania. I had trouble writing with the squeeze bottle which is what I intended to do with it. I had used Jones Tones for over 20 years and never found a fabric paint that could compare with their brand. I was so upset when I heard that Jones Tones had been sold and they wouldn't be making it any more. Then I found out that the company that took Jones Tones over( Allure) is the same product. I am very happy to find someone that sells Allure. I have tried a couple of bottles of Allure and it works just great. You will be hearing from me shortly. Can't say enough good about this fabulous paint! I have used Jones Tones paints for at least 25 yrs. and they are by far the best fabric paints I have ever used! I have tried a lot of different brands well known name brands but none compare to the quality durability & versatility. Simply amazing versatile fun! Combine to the excellent Dharmatrading service a winner! exactly what i wanted! & you made it easy to get. Glitter Jones Tones Gold Red Silver : sparkles very beautiful when applied and dried out looses sparkle after washing. Looks very bad. Washed my costume in only 30 looked very gummy and not nice. Not the first time using these allways the same effect. The color is dry won't get out from the bottle. Unusable. The only paint I use on my shirts. No other like it on the market. Only bad part is the stores in my area no longer carry it. Jones Tones is a marvelous product! I have been designing and painting stage costumes for entertainers for the past 20 years using only Jones Tones. I also use Jones Tones glitter as my costumes are very glitzy.I do love the fact that it never gets hard or cracks. My costumes wash & dry beautifully and last for years. Kind of ok but not nice and thin like tulip fabric paints. Fair needs to be thinner.